In addition, you may need a special hitch package to ensure that your car or truck doesn't suffer any damage. 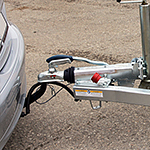 Hitches need to be strong and durable to tow a camper for long periods of time. One thing that you should do is only pack the front of the camper, but you don't want to add too much weight, as it will increase your towing needs. Want to see if your car is ready for towing a camper? Stop by Wagner Kia of Shrewsbury for help.